Initially I did not use to write comments with the code thinking that those are not required, just occasionally I would write so that I can understand. We usually want to finish coding as soon as possible, as that is what matters in the program output. Later when I heard that comments are very important so that others can also understand the code, I started putting comments in my code liberally. But when recently I encountered some articles/book about comments I was shocked for how bad comments can be and why I didn’t think of it earlier. Below are my learning I want to share. In maintenance phase specially, we tend to forget to update them as the code changes as when we change them we know the code (well.. little bit) and comments don’t contribute to the code. We write code in a way it is easy to write, not easy to read. Even if we think of others and update the comments whenever we touch the code, others may not feel the same. And as they are not part of the code, the available tools like static code analyzer cannot detect the discrepancies between code and comments. Some comments can be specially hard to maintain. Not only it wastes the space, it can add confusion if it is not accurate. The code itself should be clear enough to understand. This was the main reason why I removed my earlier comments. Crutches for bad code: We should have the mentality while writing code as if comments do not exist, so that the code itself is easy to follow. 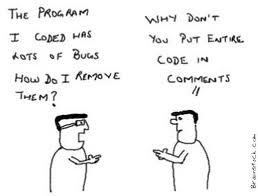 Someone said “Comments are like deodorant to the stinky code“. Some people use them as crutches for their bad code. The beauty should be in code not in comments. I’ve also seen at many places old code lies here and there commented. If it is not required now, it should be removed rather than lying and confusing others. Extraction to methods/classes: Rather than having a comment for a piece of code, the code should be extracted to a method. The code should be properly re-factored time to time. Code should be properly modularized to different components, classes and methods. Relying on version control system: For recording the history of code, version control systems are to be relied on, not the commented code. Many people keep the old code as commented while writing new code, which is totally unnecessary now a days. Intentions: You should mention your intention while writing code for example when you take some decision out of different alternatives. You should mention the why, not the what/how about the code. You can also mention the important TODOs in the comments. Standard documentation: For example Javadocs should be used in public APIs. This entry was posted in Uncategorized and tagged bad, code, comment, good on August 18, 2013 by jvishal.